Bayern Munich goalkeeper Manuel Neuer laughed at rumours he was going to announce his retirement to the media on Wednesday. The 33-year-old missed the majority of the 2017-18 season due to a fractured foot and spent time out due to a thumb issue before sustaining a calf problem in March. 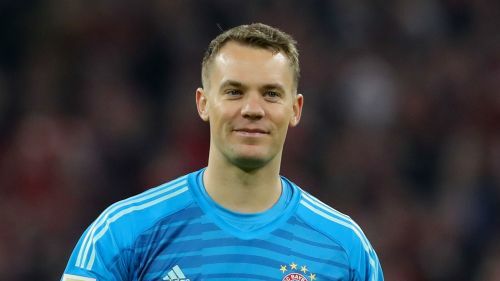 Head coach Niko Kovac confirmed Neuer suffered a recurrence of the latter injury at the weekend, but the keeper was surprised by suggestions he was set to hang up his boots. "We were laughing about that to be honest," said Neuer. "We agreed on this press conference a week ago and I just guaranteed that I'd be available because a lot of people wanted to hear me speak, so that's why I didn't cancel this." Neuer, who hopes to return in time to face RB Leipzig on May 11, thinks his muscle issues are part and parcel of coming back from a long-term absence. "I think I'll be able to work more after two weeks, but it's difficult to tell you when I'll return to the pitch. My goal is to return to fitness as soon as possible and to do everything I can to achieve that," he said. "I think Leipzig is a realistic goal for me, but we'll have to take it step by step. I should be able to train fully after two weeks. "Looking back, I was injured for more than a year after I fractured my foot and was on crutches for six months and honestly I expected to have muscle injuries much sooner, like in the first half of the season. "I was injured for so long that it's normal to have minor muscle issues. Fortunately, it's only a minor one now, nothing that'll keep me out for a couple months. "You can't predict these things. It's not like I have any regrets or am frustrated with past decisions – nothing indicated an injury and these things just happen in top professional sports." Sven Ulreich is expected to start in place of Neuer when Bayern take on Werder Bremen in the Bundesliga on Saturday and the DFB-Pokal semi-finals four days later. After impressing during Neuer's absence last season, Ulreich committed a huge error at the Santiago Bernabeu when the Bavarian giants were eliminated from the Champions League semi-finals by Real Madrid. However, Neuer believes his understudy has proven himself a competent keeper and will help the team navigate a pair of tricky matches against Bremen. "I don't think we should talk about that [his mistake against Madrid], but about how many good games he played. We know he showed very good performances in the past and I'm convinced he'll do so in the next games," he said. "[Bremen] are a very strong team, they like to play football, they're good at counter-attacking and have a strong offence. "They won away against Dortmund, they've got good spirit and unit and that's why we should be wary. It's definitely not going to be easy."